Creatinine is an important blood test to identify early kidney diseases. Unfortunately, several medical conditions can cause abnormal creatinine levels in the blood. This Complete Guide will explain the importance of creatinine blood test and how to interpret test results. Creatinine Blood Test Quick Summary..
Creatinine is a medical test in routine blood and urine tests for kidney function, and it’s a reflection of general metabolic health. A chemical “Creatinine” is one of human waste that the body must expel or those wastes can toxify your blood. The organ responsible for creatinine clearance from our blood is the kidneys. 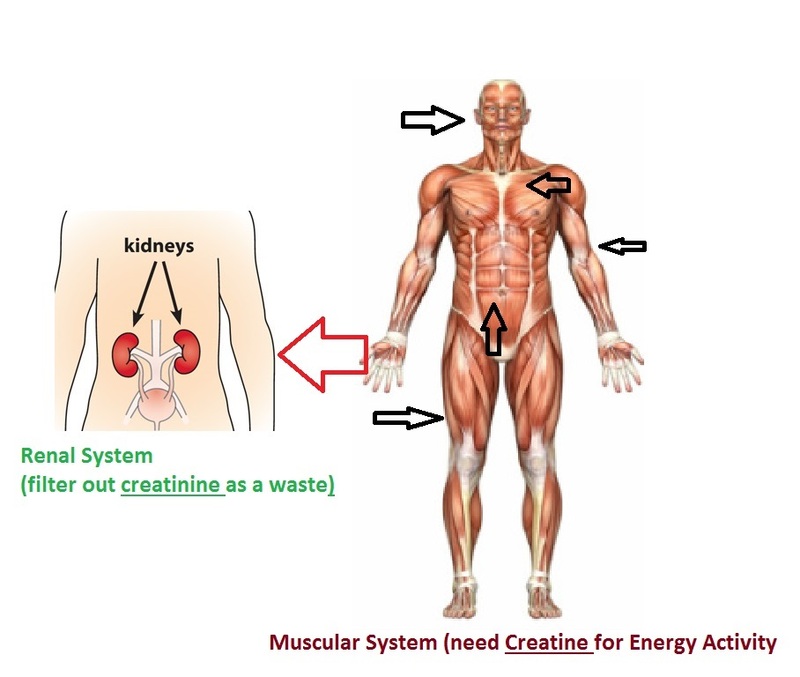 Creatinine comes from breakdown of a chemical called “creatine” in muscles to produce energy for movements. Conversion of 2% of muscle’s creatine would produce creatinine and the healthy kidneys can discard it easily. Creatinine is the most accurate renal function test today and a test of choice, and this is due to three facts: constant Conversion of creatine to creatinine by the body, muscle mass is relatively constant during the day, and kidneys don’t retain creatinine. What to do before going to laboratory? Doctors order creatinine test and may write it in other formats as: Creat; Blood Creatinine; Serum Creatinine; S.creat., cr lv, Cr Cl, Urine Creatinine, or creatininuria. You don’t have to fast before serum creatinine test. Samples required: 1 ml of blood, random urine sample, and urine collection for 24 hours. and any value outside the range is considered abnormal and represent a degree of kidney damage which requires a treatment. Reference ranges that should all healthy people have and all patients should target. Age: Who has higher normal values of creatinine? Muscular young or middle-aged adults while Elderly persons, women, and children have less normal values of creatinine due to age and muscle mass together. Continuous Decreased Muscle Mass especially for malnutrition, severe weight loss, long standing illnesses. Therefore, creatinine level will be lower than expected normal limits for their age. Most people discover that they have high creatinine by accident after a general check up without previous signs of chronic kidney disease. For example: A 50 years old man came to the laboratory room complaining of pain in his body and general exhaustion that he did not know why. The laboratory technician has performed general check up tests and includes liver, kidney, heart and complete blood count. which is a very high level that reflects a serious and chronic kidney disease. What do high creatinine levels mean? When creatinine in blood test is a value over the normal range we say that your creatinine is high or elevated and kidney is impaired in function. when the kidney function impaired or there’s kidney disease the renal system becomes unable to discard the creatinine and other wastes from our blood. The high creatinine level means how much damage are in the kidney’s tissue and how much toxemic products remain inside the blood without clearance. What causes high creatinine levels? For many reasons creatinine is elevated for a short time while prolonged and become chronic due to other reasons. Recurrent renal illness conditions experience high creatinine levels. Lab results may show elevated serum creatinine about 2.5 or higher. If renal dysfunction patients have infections such as cold, pneumonia, intestinal infection, urinary tract infections can increase creatinine level in short time. Men or women with renal dysfunction(abnormal) and have cold, UTI, intestinal infection or pneumonia may experience elevated kidney function test results for a short period of time. Serum creat. results commonly show around 1.4 for mild infections or around 2.0 for moderate CKD, and may show higher if prolonged. The kidney problem always is a result of other serious condition somewhere in the body and high creatinine commonly seen due to other diseases and not kidney diseases. Elevated creatinine levels in infants is associated with bacteremia, blood cultures can approve or decline this interpretation. Elevated levels of s.creatinine in adult males is linked to the risk of prostate cancer. Renal toxic drugs such as (ciclosporin, aspirin, ibuprofen, diclofenac, and gentamicin) will cause elevation of serum creatinine levels up to marked kidney disease and might not be cured. Blood testing results for a woman taking ciclosporin after kidney transplant to prevent rejection: S.creat 3.0 mg/dl and bl. Urea 90 mg/dl. (common results show around these numbers). Uncontrolled high blood pressure will raise serum creatinine level due to abnormal blood flow to the kidneys. Lab results for a man with stage 2 hypertension: Blood pressure is about 160/100 or higher, creatinine level 4.0, urea 130, hyperglycemia (blood glucose read about 200 and HBA1C reading 7.5 or higher), albumin in urine, and glucose in urine. Hypothyroidism causes slow renal function. consequently, renal inflammation accompanied by elevated creatinine. Test results may show free thyroxine (S.t4) level 0.7 (N:0.8-1.9 ng/dl), S.creatinine 1.8 mg/dl. Rhabdomyolysis is a secondary causative agent of kidney inflammation and elevating creatinine due to increased myoglobin in the blood. Rhabdomyolysis refers to muscle destruction and means dissolution of skeletal muscle. Results reading: e.g. s.creatinine 3.5 mg/dl, serum CK test increase up to 100,000 U/L or more (normal: 22-198 U/L), elevation of uric acid 8.0 or more, and urine shows brown discoloration. Uncontrolled type 2 diabetes is a causal reason of high creatinine levels. Long period of hematuria (blood in urine), proteinuria (protein in urine) can cause a high creatinine level. Lab test results for a person have abnormal urine analysis may show: Serum creatinine 2.0 (Normal: up to 1.4 mg/dl) and blood urea 60 (normal: up to 50 mg/dl), urine test show RBCs, pus cells, protein, and bacteria rods. Potentially fatal infections such as borrelia and strep infections. Low blood flow due to burns or excessive blood loss leading to shock such as in sever anemia. I have high creatinine and no kidney disease? Mild increase in creatinine level after vigorous exercise. While moderate exercise causes the creat. level to go slightly higher but still inside the higher normal limit. Diet rich in meat may lead to 10% – 30% increase in creatinine results due to increased protein content in the body and thus the metabolite creatinine increased. thus a relative decrease of blood flow rate to the kidney lead to inflammation of renal systems. Exhaustion, extreme tiredness, and taking a little time of rest raises the level of creatinine in the blood temporarily. P.S. you can use creatinine and BUN levels to adjust a DIY protein diet. What to do with high creatinine blood test results? Elevated creatinine occur commonly by many reasons other than kidney failure. So that, in order to drop creatinine levels permanently it’s better to work with your doctor on the underlying causes of kidney damage before start treatment course. Understand well why creatinine levels increased. Low intensity exercises such as walking or practicing yoga help the body to convert more food to energy, hence the creatinine increased but not elevated over the acceptable healthy range, however running, weight lifting, or playing basketball can cause higher creatinine levels than normal limits for corresponding persons. It’s important to stay hydrated with 6-8 glasses (250-ml) of water each day in order to produce more urine and wash out excess creatinine, consequently stop creatinine levels to go high. Take care of excess fluid intake as this can put an extra pressure on both kidneys and elevate the creatinine level. Seven to eight hours of sleep every night is the optimum amount of sleep to keep creatinine levels at the healthy range, because the body slows down processes while sleeping which allow more creatine to be converts into creatinine and passed out. In contrast, taking less than six hours of sleeping and sleep deprivation make the kidneys more stressed and decrease their abilities to filter out toxins. Drink around two (250-ml) glasses of herbal tea (e.g. chamomile, nettle leaf, dandelion root) each day can stimulate the kidneys and cause an increase in the production of urine. As such, more creatinine can be passed out of the body. Salvia contains lithospermate B, therefore helps to increase GFR and normalize renal function. Adjust kidney disease treatment such as ACE inhibitors and cyclosporine to disallow their effect of elevating creatinine. Lower the doses of ibuprofen and other NSAIDs which cause elevation of your creatinine. Avoid creatine and vanadium supplements as the studies shown their negative impact on creatinine levels. Taking long term antibiotics against high antistreptolysin O titre can damage your kidney and elevate creatinine, consult your doctor. Administer Repaglinide 0.5 – 4.0 milligrams before each meal even if you skipped or forgot the meal, as the well administration would save the kidney’s tissue from damage after uncontrolled hyperglycemia. Make it a habit to take pill that normalize the hypertension, Normal benazepril daily dosages 10 and 80 milligrams. Hydrochlorothiazide daily dosage is 12.5 and 50 milligrams. Ketosteril targets elevated creatinine levels with a regular dose 4 to 8 tablets at each meal taken daily three time. Antioxidants such as Alpha lipoic acid supplements can energize the kidneys and neutralize creatinine levels, daily dosage is around 300 mg.
Chitosan is used to reach weight loss with 1000 and 4000 mg per day and useful in lowering creatinine values. These medications can help normal creatinine levels return again after taking the dosage. Kidney cold laser therapy can do lower creatinine by revitalize the kidneys to do more filtration of blood wastes. Adrenal glands cold laser therapy (above the kidneys) can improve sleeping which has a good impact of kidney function. Cold laser therapy on the Vagus nerve in the neck is a good helper of well circulation of bloodstream to the whole body which reduce the risk of kidney damage that is caused due to low blood flow. When you have low levels of creatinine e.g. creatinine less than 0.3 mg/dl or less than 60 micromoles per litre. What does low creatinine mean? As the healthy kidney should discard creatinine from blood the low serum creainine could indicate nothing but an efficient and effective kidneys. wrong testing procedures which is not accurate enough can be a reason. Or just you forget to look to the right normal ranges for age and gender. Therefore low creatinine can be a manifestation of normal creatinine levels. Low urine creatinine can be an abnormal sign of serious renal issue, a consultant can resolve this. A disease of muscles which cause low muscle mass such as muscular dystrophy or natural muscle weakness by aging. Diet poor in protein content. Pregnancy can be a reason of decreased blood creatinine levels. After dialysis you can see a significant decrease in renal function tests. Does renal stone increase or decrease creatinine result? A moderate stone can block urine passage from blood to urine ending. Thus all waste products including creatinine will remain inside or near kidney’s tissue this can lead to further inflammation to the kidneys. So that, the kidney stones will rise serum creatinine level significantly and may be more than 3.0 mg/dl. Serum creatinine is the early and principle renal function test and useful to follow-up treatment to target normal creatinine levels. GFR is a test comes by calculation of creatinine and age equation or by urine creatinine results, GFR is a useful renal failure marker incases of Chronic Kidny Disease, therefore CKD can be classified into 5 categories upon GFR results. Blood Urea and BUN: with creatinine used for diagnosis of kidney inflammation for the first time and for following up treatment and dialysis. Your doctor may order urine creatinine test and microalbuminurea test in the case of follow-up treatment of diabetes and glomerulonephritis. Estimations such as Albumin to creatinine ratio or BUN to creatinine ratio should present more accurate results. Some tests can show abnormal results in case of kidney inflammation such as cholesterol and triglycerides. Urine analysis can show blood cells and protein in urine in cases of renal impairment. CK test ordered for patients of renal failure due to muscle dystrophy. Creatinine blood levels not responsive to lifestyle changes as changing with the kidney status. Although the exercise, high protein diet, and creatine supplements are all of benign causes of high creatinine in the blood test. What do creatinine blood test results mean? Creatinine results within normal limits are expected for healthy persons who have normal kidneys. While mild elevated creatinine values are associated with secondary causes such as infections and toxic drugs. Moderate increasing of creatinine level may appear with muscular dysfunction and chronic diseases such as DM and hypertension. However the panic creatinine levels come from renal failure and untreated chronic diseases. We are welcome free explanation of your blood creatinine results, follow on Fb, Twitter, and Youtube. What Does Backpain with Normal Creatinine Mean?